Countless consumers around the globe cherish the customization options available to them when it comes to their smartphones, but as many Android veterans can tell you, there’s still no better option for the modern, tech-savvy consumer when it comes to your Android phone than running a pure stock OS. Despite the whimsical gadgets and so-called “improvements” being offered by certain custom editions, my handheld experience has always drastically improved when I switched to the tried-and-tested stock OS — whether that means rooting my latest, greatest Samsung device, or relying on the next edition of Google Pixel smartphone. In my experience, Android phones desperately need to stick to running stock OS, because using all those customizable options offered by the likes of Samsung and Huawei will inevitably ruin your handheld experience. Here’s why. When I purchased my first vanilla Android device, I was astounded by the lack of bloatware covering my home screen. The device launched apps quickly and was easy to navigate; it was the way Androids were supposed to be. These days, however, you can’t pick up a device without encountering some custom-designed garbage more likely to encumber you than anything else. For consumers like myself who are sick and tired of the deceit that comes with the world of customization enabled by Android’s open-source nature, it’s time to get back to the basics, and remember just how great stock OS can be. Well over two billion devices around the world rely on Android to fulfill their basic duties, according to Google, and undoubtedly a strong majority of those devices are running custom OS outfitted with all sorts of dazzling special services by overeager manufacturers. It’s true, tech-savvy consumers and smartphone manufacturers alike have long prided themselves on equipping their devices with special versions of the OS capable of tackling a myriad of extra challenges. However, it’s a simple matter of fact that a the stock OS remains the most efficient and user-friendly experience smartphone owners can have. Besides the fact that fancy, custom-made OS have a tendency to bloat your system with unnecessary flair, they can generate a slew of headaches for you, especially when you’re at the early stages of using them and still trying to figure out all of the little quirks. The open-source generosity of Android isn’t all bad, of course; many companies and individuals have chosen Android time and time again because of the way it allows them to custom-tailor their experience. If smart consumers don’t start reverting to stock Android OS sooner rather than later, however, we’re going to be above our heads in glitchy, over-bloated OS before we know it. 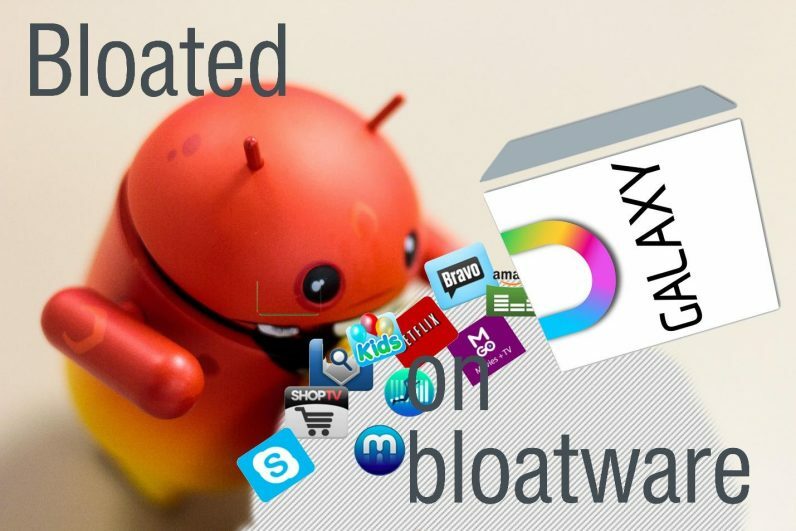 For instance below is a list of some of the bloatware that are clogging up your Samsung devices, do you ever use any of them? Basically, you don’t need them. Nobody does. One of the primary reasons I’ve come to rely on stock Android OS is because I couldn’t live with myself if I knew I was willingly opening my devices up to an outside attacker. Security fears are growing every day, for good reason — now more than ever, our devices simply aren’t safe. As hacking fears continue to grow around the globe, however, I’m sleeping soundly thanks to the fact that Android’s vanilla OS remains a relatively safe way to enjoy the benefits of a modern smartphone without making myself or my data vulnerable. Those two billion devices we mentioned earlier have one glaring flaw; they’re so fragmented and different that it’s nigh-impossible to secure them all. By relying on a vanilla OS that gets a hefty amount of attention from the top minds at Google, however, I’m getting a leg up on other manufacturers when it comes to maintaining the integrity of my digital systems, not to mention my digital privacy. One should essentially never expect a custom Android OS to be more secure than Android’s stock OS, particularly if the Android ecosystem continues to be flooded by a multitude of devices running on custom OS that have their own security vulnerabilities. Besides security benefits, however, one key facet of Android’s stock OS keeps calling me back — I don’t want to clutter my handheld experience. Smartphones are an integral part of modern life, try as we may to avoid them from time to time, and it’s a matter of fact that we need a smooth, easy-to-navigate OS unless we want to spend half of our time screaming at our phones as they load. A vanilla OS offered up by Android will be infinitely easier to learn and navigate than the dizzying maze that many custom OS create. Faster updates on Android’s stock OS, too, make it better for those smartphones users like myself who want the best updates right away without all of the fluff. While a custom OS supplied to you by the likes of Samsung could take mind-numbingly long periods of time to update, an Android device running a vanilla OS will constantly be outfitted with the latest and greatest updates. Some critics may argue that stock OS doesn’t give you many options, however, I’ve never found that to be the case. There are plenty of choices when it comes to an Android device running a vanilla OS. If you’re really looking to get the most out of your smartphone experience, consider swapping your Android device over to a default, stock OS that won’t let you down in the way that fancy custom version inevitably will. More storage space, quicker updates, and an improved performance can all be yours if you join the ranks of those tech-savvy consumers using stock OS on Android phones, so what are you waiting for?